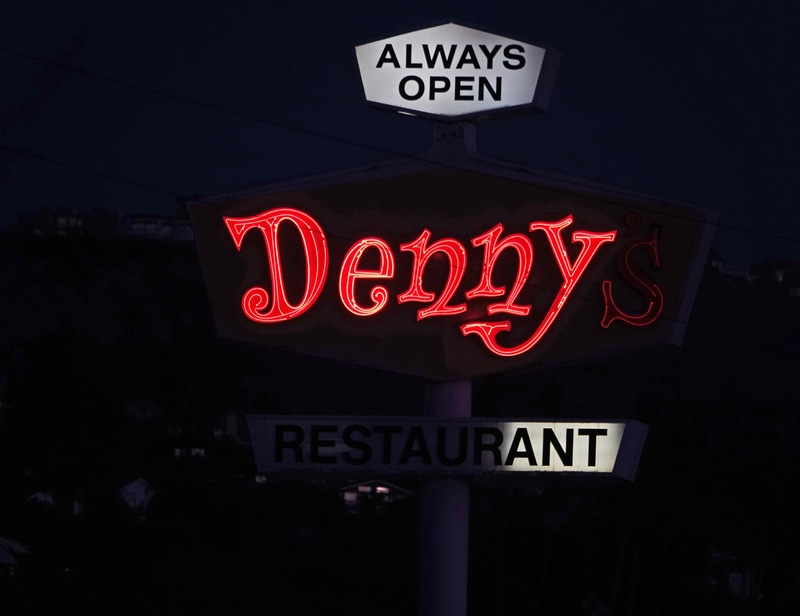 Is it time to declare our Denny’s sign a landmark, protected by law? The ever-morphing sign is arguably the signature of San Clemente. Nighttime freeway travelers know they have arrived when the sign, floating in the dark, looms ahead. Will it say “enny,” “Den,” “y’s” or what? You never know. It’s a source of entertainment. I imagine there are drivers and passengers who take bets. It’s so comical, it probably has fans. They exit I-5 at Avenida Pico to bow to it, then order a “Grand Slam.” Whoever lost the bet pays the tab. “We may be witness to a new record,” he proclaimed. “Always open, always broken,” someone wrote. “I love that it’s different every time,” another said. “My kids and I have been keeping track of that sign for 20-plus years,” someone wrote. Our Denny’s opened in the 1960s when I-5 did. I was a summer dishwasher there during my San Clemente High years. The neon was picture-perfect then. San Clemente was quite a menagerie of business signs. Look at photos of Ole Hanson’s Spanish Village in the 1930s, 40s and 50s, and you’ll note a jungle of signs along El Camino Real. I don’t recall any outrage over them when I was a kid. They were just part of the landscape. When I-5 opened, tall pole signs were added. By 1981, the San Clemente City Council decided a mishmash needed cleanup. Over protests from business owners, the council imposed strict new sign limits. Merchants, given a grace period, had to remove dozens of signs. Maximum height for any new sign was reduced to 15 feet. Preexisting freeway pole signs were allowed to stay, as the city tried but failed to convince state legislators to allow gas-food-lodging logo signs at our off-ramps to help capture business off I-5. Remaining pole signs had to be maintained, and owners couldn’t change the type of business. Most San Clemente freeway pole signs came down, either because a business closed and long remained closed, like Carrows, or because a business changed, like the El Camino Real Chevron that replaced auto repair bays with a grocery mart. Valero’s owner mounted a lengthy legal battle to redo the station but keep his sign. He prevailed. He’s renovating now. In 2016, the City Council updated the sign ordinance but didn’t force pole signs down. I thought the historical society might want it. RIP, neon fish. It resides deep within Prima Deshecha. One can argue that Ole Hanson’s Spanish cottages are no longer the only heritage structures in town. The city now recognizes downtown’s “mid-century modern” buildings as worthy of preservation. I remember the Planning Commission also looking at protecting tiki-style buildings that were very popular for a time, after Hawaii became a state. The old Chamber of Commerce was one. San Clemente’s few remaining pole signs are a vanishing artifact, like the quirky, tacky neon remnants of old U.S. Route 66 that have evolved into a tourist yellow brick road, a national shrine to a bygone era. Some residents will crave to see the Denny’s sign removed. “It’s a blight,” one Facebook post declared. Don Brown, city planning commissioner, noted that old neon technology is expensive to maintain or update. Denny’s evidently is struggling with it. “Can I buy a vowel, please?” a Facebook poster implored. Fred Swegles is a longtime San Clemente resident with more than 47 years of reporting experience in the city. Main image by Fred Swegles.